Jean Earley, 98, dances at the 12th annual veterans luncheon Monday afternoon. Chapter 133 of the Disabled American Veterans, or DAV, bused more than 230 veterans from Broward and Palm Beach counties to the Seminole Casino Coconut Creek on Monday. The alternative Turkey Day focused on celebrating their service. After a blessing over the food — and one for military officers deployed on active duty — the feast began. Jean Earley skipped the turkey and gravy this year. "Mostly green vegetables — that's what I thrive on," she said as she loaded her plate with broccoli. Earley was a flight nurse for the Air Force during World War II, and she still wears her green uniform. She transported wounded veterans by plane to hospitals near their hometowns so family members could visit them. Now, she lives in a senior home in Deerfield Beach. Last year was the first time she came to the lunch, and she said she'd been looking forward to coming back. "It's a 'thank-you' every year," she said. At a nearby table, Phil Esposito, 75, also came back — for his fourth veterans Thanksgiving. This year, he chose Italian sausage, prime rib and some roast pork. "I love it," he said about the event. "I would never give it up for anything." Esposito served in the Navy just before the Vietnam War. His job was to work in the engine room of ships. "And I thank God that I'm around to live from year to year," he said, looking around the room. The DAV sees the event as an opportunity for local veterans to expand their community of comrades. 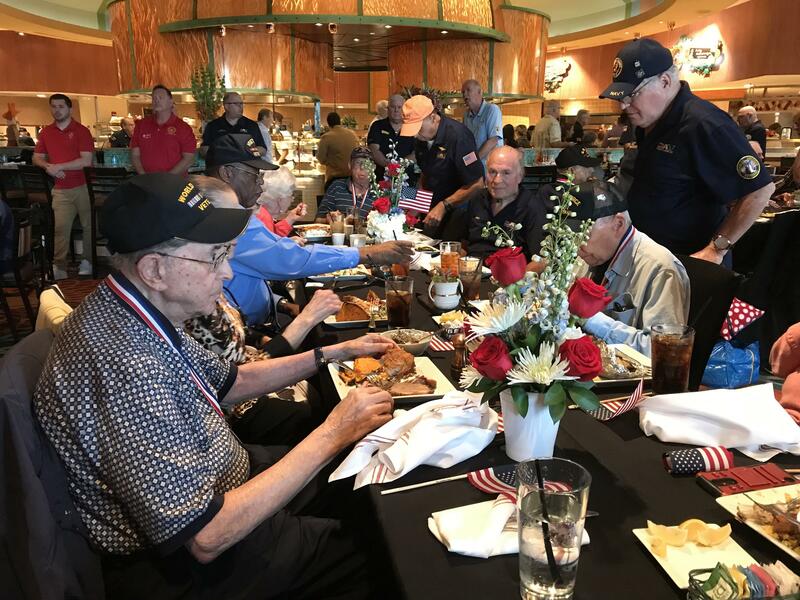 The state commander of the DAV, MaryAnn Keckler, said she hopes more chapters across Florida can replicate what Broward is doing because it's more than just a meal for the veterans who come. "A lot of them do not have families. Basically, this is their family," she said. "This gives them some encouragement. They're not just sitting in a nursing home or a hospital or something. They are out there with people who really care about their service." Veterans from World War II and the Vietnam War ate together at the veterans Thanksgiving lunch earlier this week. The casino donates the venue and all the food to the Broward DAV chapter every year. The casino has a new president this year but plans to keep the tradition going. The crowd ate and "swapped war stories," as some characterized their conversations. At one point, everyone stopped to sing the national anthem and "God Bless America." Earley, the flight nurse, also had something else to celebrate: Tuesday was her 98th birthday. She received some happy birthday wishes. "I love coming here," she said, leaving her meal to dance in the middle of the room as swing music started to play. 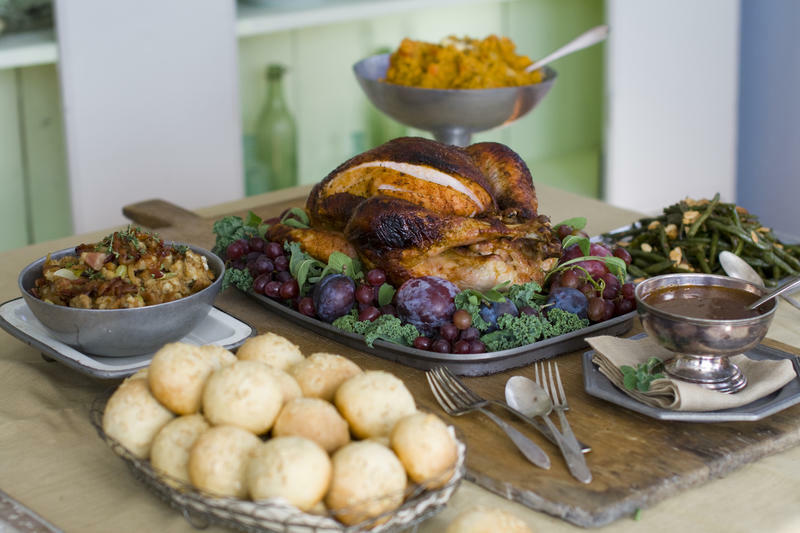 Tips for a successful Thanksgiving feast. We’ll talk turkey and all the trimmings with New York Times food editor Sam Sifton. In the military, the Purple Heart medal is awarded to members of the armed forces injured in enemy combat. It's a sign of bravery and gratitude that can trace back its origins all the way to 1782, with General George Washington. Over the years, there have been different civilian initiatives to honor Purple Heart recipients. In the 90s, for example, some nature trails became designated as "Purple Heart Trails" so hikers could commemorate soldiers while they explored across the country. That idea spread. Now there are Purple Heart-designated cities, counties, and even whole states. Lighthouse Point is Broward County's latest city to write up a proclamation to remember recipients of the medal - and recently Broward County designated itself a Purple Heart County as well. One local group of veterans led the charge to make that happen and they say they won't stop until they get the chance to talk to every municipality in the county about what it really means to be Purple Heart-designated.